Spiritual Intelligence (SQ) is defined as, "The intelligence with which we address and solve problems of meaning and value, the intelligence with which we can place our actions and our lives in a wider, richer, meaning-giving context, the intelligence with which we can assess that one course of action or one life-path that is more meaningful than any other." 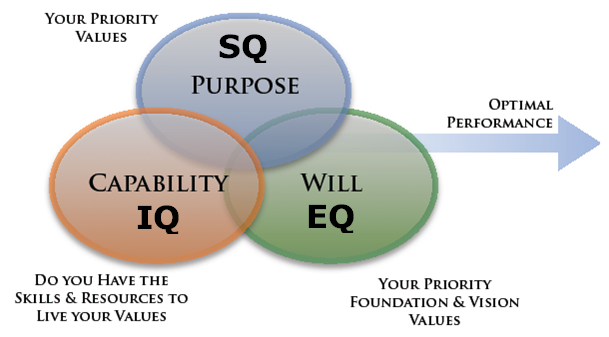 SQ essentially integrates IQ (the traditional Intelligence Quotient) and EQ (Emotional Intelligence). It is our ultimate intelligence. IQ is associated with the serial processing activity of the brain (rational thought). It is associated with our neural tracts. Neural tracts learn (are wired) according to a fixed program, the rules of which are laid down in formal logic. The learning involved is step-by-step. and rule bound. When we teach children their times table by rote, we are encouraging them to wire their brains for serial processing. It produces the kind of thinking that is useful for solving rational problems or achieving definite tasks. Much instinctual behaviour is also accounted for by serial processing. An instinct can be thought of as a fixed program, as in the imprinting instinct in ducks and other birds - where the newly hatched bird identifies as its mother the first caring object or person it meets, and remains stuck on that identification. Some over rational human beings can get stuck in a programmed mode of thinking in the same way, finding it difficult to bend rules or to learn new ones. EQ. Associative thinking underlies most of our purely emotional intelligence (EQ) - the link between one emotion and another, between emotions and bodily feelings, emotions and the environment. It is also able to recognise patterns like faces or smells, and to learn bodily skills like riding a bicycle or driving a car. It is 'thinking' with the heart and the body and so is thought of as our 'emotional intelligence' or the 'body's intelligence'. The structures within the brain with which we do our associative thinking are known as neural networks. Each of these networks contains bundles of up to 100,000 neurones, and each neurone in a bundle may be connected to as many as 1,000 others. Unlike the precise wiring of neural tracts, in neural networks each neurone acts upon or is acted upon by, many others simultaneously. Unlike serial neural tracts which are rule bound or program-bound and thus unable to learn, neural networks have the ability to rewire themselves in dialogue with experience. All associative learning is done by trial and error. This kind of learning is experience-based: the more times I perform a skill successfully, the more inclined I will be to do it that way next time. Associative learning is also tacit learning - I learn the skill, but I can't articulate any rules by which I learned it and usually can't even describe how I did so. Neural networks are not connected with our language faculty, nor with our ability to articulate concepts. They are simply imbedded in experience. We feel our skills, we do our skills, but we don't think or talk about them. We develop our skills because they give us a sense of satisfaction or a feeling of reward, or because they help us avoid pain. Thus most emotions are developed by trial-and-error, a slow associative build-up of response to certain stimuli. and they are quite habit-bound. Once I have learned to feel anger at a given stimulus, it is difficult for me to react differently next time. Much of psychotherapy exists to help people break the habit of long-standing but inappropriate emotional association. Like other aspects of associative intelligence, emotions are not immediately verbal. We often have trouble talking about them, at least with any accuracy, and they are certainly not always 'rational' in the sense of obeying rules or predictions. They often respond to incomplete data in unpredictable ways. Associative intelligence is able to deal with ambiguous situations, but it is also 'approximate'. It is more flexible but less accurate that serial thinking. The disadvantages of this type of thinking are that it is slowly learned, inaccurate and tends to be habit-bound or tradition bound. We can relearn a skill or an emotional response, but it takes time and much effort. And because associative thinking is tacit, we often have difficulty sharing it with others. We can't just write out a formula and tell someone else to get on with the job. All of us must learn a skill in our own way, for ourselves. No two brains have the same set of neural connections. Similarly, no two people have the same emotional life. I can recognise your emotion, I can empathise with it, but I don't have it. SQ. Spiritual intelligence (SQ) could also be called the 'intelligence of meaning'. It is what makes us essentially human: the ability to plan, to make sense of our emotions, to control our impulses, to make choices, and endow our world with meaning. The frontal lobes of the brain are where our ideas are created; plans constructed; thoughts joined with their associations to form new memories; and fleeting perceptions held in mind until they are dispatched to long-term memory or oblivion. IQ is associated with serial processing in the brain via hard-wired neural tracts and EQ emerges from associative processing via the brain forming, by trial-and-error, neural networks. SQ seems to emerge from neural oscillations at 40Hz (cycles per second) that excite the relevant (for the particular thought activity) parts of the brain. This activity is co-ordinated/controlled by the frontal lobe. Carter, R. 1998, Maping the Mind, Weidenfeld & Nicolson, London. Csikszentmihalyi, M. 1998, Flow: The Psychology of Happiness, Rider, London. Freeman, W. 1999, How Brains Make Up Their Mind, Phoenix, London. Lowen, W. & Miike, L. 1982, Dichotomies of the Mind: A systems Science Model of the Mind and Personality, John Wiley & Sons, New York. O'Murchu, D. 1997, Quantum Theology: Spiritual Implications of the New Physics, The Crossroad Publishing Company, New York.